The New York State Canalway Water Trail is a great destination for paddlers, featuring over 125 public access points along the 524-mile Canal System. There are no permits or fees required for locking through with a non-motorized vessel (kayak, canoe, stand up paddle board (SUP), etc.). Paddlers can always contact the locks by phone, but it is also recommended that they bring a floatable, waterproof handheld marine band VHF radio for contacting lock operators (channel 13) and other boaters (channel 16). Camping and various other amenities abound throughout the system, with more and more being added each year. 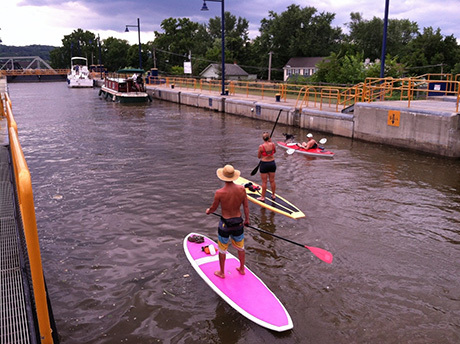 The Canalway Water Trail is part of a growing system of water trails across New York State. Both the Eastern Erie Canal and Champlain Canal sections join up with the Hudson River Greenway Water Trail , designated a National Water Trail by the United States Department of Interior in 2012. The Canal Map lists access points and associated amenities. Each launch location is identified by an icon, which when selected displays detailed information such as the location, type of launch, parking, camping, restrooms, etc. Beyond paddling on the active canal system, there are numerous opportunities to explore the mostly disconnected, but still watered sections of abandoned canals, such as the Old Erie Canal State Historic Park , Camillus Erie Canal Park , Vischer Ferry Preserve , Old Oswego Canal near Fulton , Old Champlain Canal in Waterford , or Glens Falls Feeder Canal .